I'm gonna toot my own horn a little here. 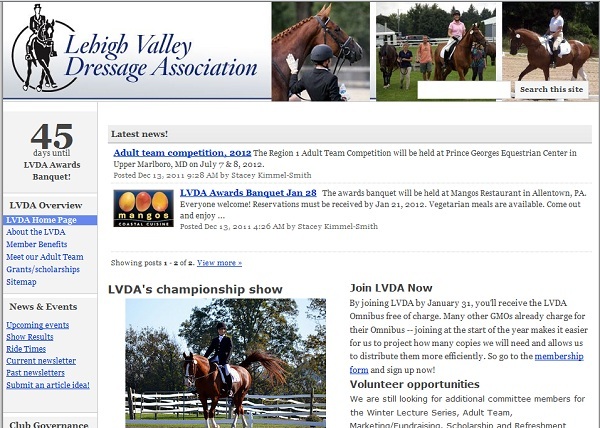 I've been co-editing the Lehigh Valley Dressage Association newsletter for the past year, along with another volunteer who is an accomplished graphic designer (she works in publishing). When the LVDA web site editor resigned (after doing a great job for years), we decided to pick up the responsibility. Technology marches forward, and it seemed like a good idea to migrate to a new platform "in the cloud," to Google Sites. Sites makes it easier to share responsibility for maintaining the pages/collaboration. Oh, and it's free. Moving to Google Sites saves us a few hundred a year. My publishing friend created a super template in Sites, and I migrated the data and added some Sites-specific features. Voila! Our new site is live at http://www.lvda.org/. I'm a big cheerleader for our small but mighty GMO--LVDA members are some of the nicest people I've met in a long time. 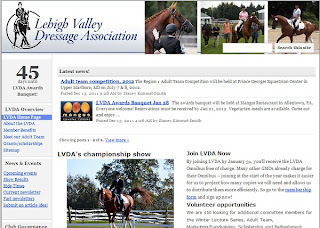 LVDA folks come from diverse backgrounds, not just dressage. We have upper level riders but also lower level riders and eventers -- some members don't really ride much. What everyone seems to share is a down-to-earth attitude and a commitment to and love for our equine partners. For a dressage group we're decidedly non-diva. I'm proud to be part of LVDAS and happy to contribute in any way I can. If you happen to be in the Lehigh Valley, and you're interested in horses, this is a great group, and membership is only $45. See our membership page for more info! ESDCTA is my local GMO. Great people there too. Seems that when you get people together who really care about horses the vibes tend to be pretty positive. Isn't it great when you can belong to a great group who shares a love of horses? I belong to a smallish chapter in the Southern Region of the California Dressage Society. It's not the chapter located closest to me, but this chapter is composed of down-to-earth people who want what's best for the horses. Members range from non-riders to juniors, amateurs and on up to FEI. Nice job with it! If you see Sally MacGowan please say hello to her from me. I boarded at her facility back in the early 80s -- lovely, lovely barn. it was there that I started eventing. I hope she and her family are doing well. That is so cool that you are at Springfields! What a small world. I was there for about 2 or 3 years when her son John, was married to Emily. Emily & John were good friends and we spent a lot of time in the apartment over the barn with my now husband. I also remember building some xc jumps for the front field. I'd never evented until I was a that barn but I had a blast. 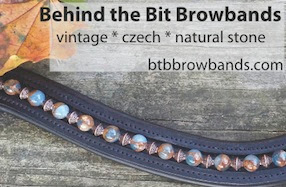 If you remember the Porter sisters, who had a tack store in Quakertown, June leased me her Hannoverian/TB cross to ride. I used to work at Lutron which is right down the road. I had a whole lot of fun there, great memories!